Sorry for not having posted this weekend, but I was otherwise occupied. Anyway, for todays post I've taken one of the pictures that the ones that know my deviantart profile will already have seen. It was taken when we went to the seaside with Iuliana's cousin. Again, rather horrid weather, but we had a very good day. 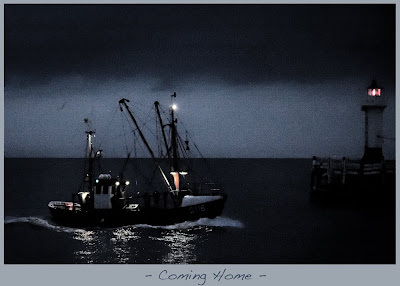 I took it when it was already dark and the last fishing boats were returning to harbour for the night. Hope you like it!